The art museum associated with the University of Oregon is going to host a camp for grade school aged children who are transgender. The University of Oregon is facing an internal division over a student body’s vote to divest from any company that has any relationship with Israel, including hummus maker Sabra. A University of Oregon symposium will help attendees answer the question, “What’s up with Whiteness?” and find their place in the world. A trio of academics has put together a holiday-themed anti-Trump race card. When university presidents get even a fraction of the abuse the rare conservative speaker in academe gets, they go into overdrive. 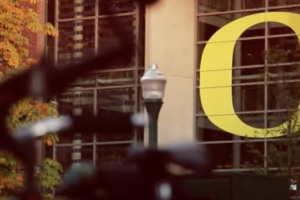 The University of Oregon is cutting 21 non-tenure track positions and 10 staff member positions in foreign language and humanities to balance their budget.